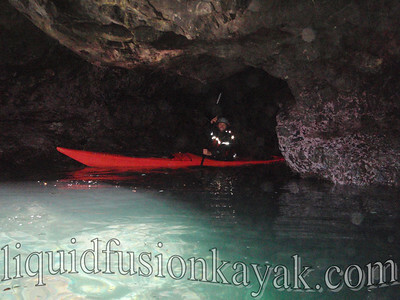 We get a lot of questions about kayaking in the Mendocino sea caves. 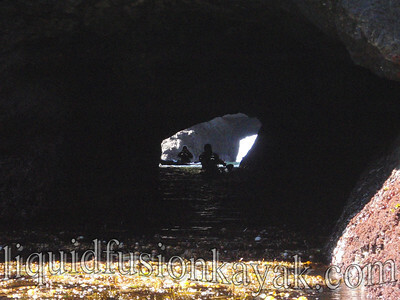 Lately, we have gotten a few requests for knock your socks off photos of kayaking in Mendocino sea caves. I realized how few quality sea cave photos we had. Part of the problem is our limitations shooting good photos in the lighting of sea caves. The low lighting and contrast of bright and dark are very hard to capture well with our waterproof point and shoot cameras. Also, the reflective tape of most sea kayakers' lifejackets and paddling gear reflects the flash. Many of our photos end up grainy or with freakish streaks in them. If you have any tips for shooting in these conditions, please share them with us. I was thinking about just this subject while my friends were out there with you having fun without me! The big problem is not enough light for the auto focus to work. My Pentax Optio W80 does have a manual focus setting--I just never use it! It gives you a range to set and I would try that and hope I could come up with a better focused shot. I'd also try using the "soft flash" option to hopefully avoid the harsh glare I've gotten trying to take cave shots in the past. You don't really want to lose all of the dark atmosphere! 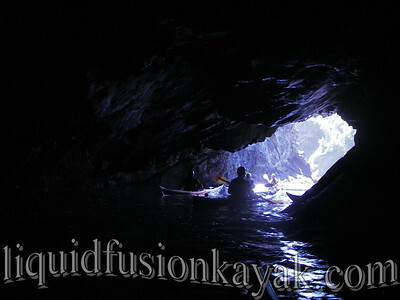 But the best photos usually seem to be the silhouettes of paddlers backlit by the cave openings! I hope to get up there and try something soon! 1. Shoot arches; same idea with more light. 2. Shoot from inside and focus on the light outside. 3. Shoot outside to get the big picture. 4. Get a camera with full control of exposure and shutter speed. I was actually inspired to do a full write up with some pictures on my blog (PaddleCaliforniaBlog). Great tips Mark and Bryant. Thanks for posting them. And yes Mark, you do need to come kayaking on the Mendocino Coast.